I accidentally discovered a truly helpful support grip to hold my 7x50 with. These are "OpticValley", nothing fancy but very heavy, too heavy to enjoy more than a quick glimpse at the sky. Got them new off Trademe a few years back for NZ$20. What you see in the picture is the common bino tripod adapter on this upside-down L-bracket. I grip it at the long bar and the other hand grips that big screw. The bar is edgy to hold on to and the screw doesn't sit well in the hand, either, but it serves alright. Last night, the first really clear night in what feels like months, the moon stood right in my western sky the whole time. 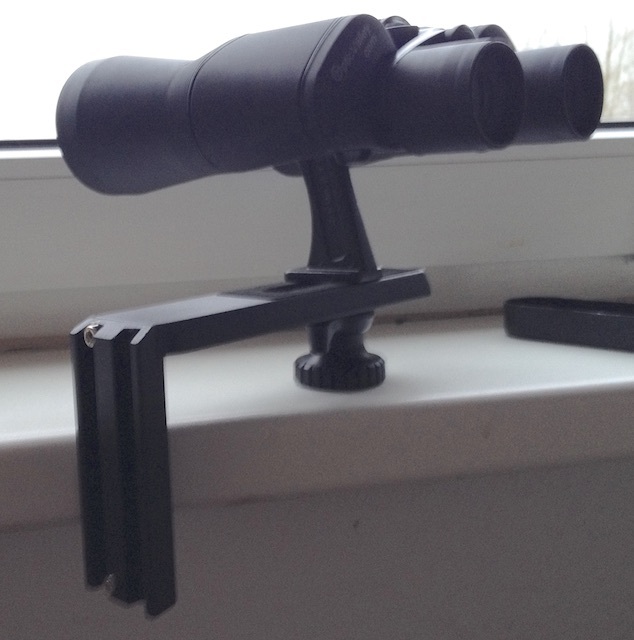 So I just grabbed my binos still mounted on the support grip and looked North-ish. It was after a 5 minutes that I realised that I'm still enjoying cruising around that part of sky, comfortably standing and holding the 7x50 without noticing that I'm holding it. No wobble, no twitching. I think stability results from both forearms staying under chin height and arms are close to the body, touching and resting on the chest while holding this contraption. That is a huge improvement I thought worth sharing. Edited by silv, 12 February 2019 - 03:27 AM. I was looking for the support group for hand held binocs. I don't have the particular equipment you used, but I liked the concept. I have a small monopod that I used to try out your idea. Held it close to my chest without extending the unit. Actually works pretty good. Arms much more relaxed. Going to keep it attached or now. I have a small monopod that I used to try out your idea. Held it close to my chest without extending the unit. Actually works pretty good. Arms much more relaxed. Going to keep it attached or now. Hey Williew, I liked your monopod idea that I looked for mini tripods or a monopod online. Until I remembered that my Rollei photo tripod was advertised as also to be used as mono. 1 leg can be screwed off. Sweet. Mounted the 7x50 on it and that's much better. Variable height and for me, with hands at chest height control still feels intuitive and is steady. No strain - much gain. I wonder whether I'd be able to quasi-handhold 12x or 15x binos with this. after a bit more testing I reverted back from your handheld monopod to the contraption above. And found an off the shelf improvement to it. Do you still use your binocs handheld on your monopod?